We use radar measurements from the Jicamarca Radio Observatory, magnetometer observations from the Pacific sector and ionosonde data from Brazil to study equatorial ionospheric electric fields during the November 2004 geomagnetic storm. Our data show very large eastward and westward daytime electrojet current perturbations with lifetimes of about an hour (indicative of undershielding and overshielding prompt penetration electric fields) in the Pacific equatorial region during the November 7 main phase of the storm, when the southward IMF, the solar wind and reconnection electric fields, and the polar cap potential drops had very large and nearly steady values. This result is inconsistent with the recent suggestion that solar wind electric fields penetrate without attenuation into the equatorial ionosphere for several hours during storm main phase. The largest daytime prompt penetration electric fields (about 3 mV/m) ever observed over Jicamarca occurred during the November 9 storm main phase, when large equatorial electrojet current and drift perturbations were also present in the Pacific and Brazilian equatorial regions. The rise and decay times of these equatorial electric fields were about 20 min longer than of the corresponding solar wind electric fields. The ratios of prompt penetration electric fields and corresponding solar wind electric field changes were highly variable even during the day, and had largest values near dawn. Also, the prompt penetration electric fields did not show polar cap potential drop saturation effects. Our results clearly highlight that the relationships of prompt penetration and solar wind electric fields, and polar cap potentials are far more complex than implied by simple proportionality factors. 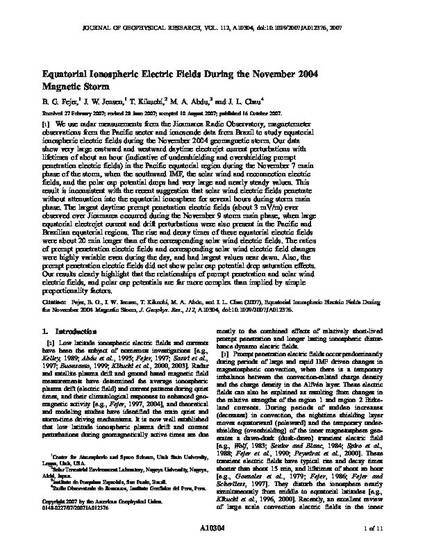 Fejer, B. G., J. W. Jensen, T. Kikuchi, M. A. Abdu, and J. L. Chau, Equatorial ionospheric electric fields during the November 2004 magnetic storm, J. Geophys. Res., 112, A10304, doi:10.1029/2007JA012376, 2007.